DESIGNED FOR THE WORLD’S BEST GAMERSExperience exceptional performance, immersive entertainment and simple convenience with 9th Gen Intel Core processors. The i7 9700K processor extends all the capabilities that users love from previous generation CPUs with even more advanced innovations that deliver new levels of performance immersing you into your computer on a variety of form factors. The 9700K features all the latest Intel technologies to allow you to have the best computing experience, and this particular CPU is unlocked allowing you to overclock it to your gaming or production needs for additional performance headroom. EXCEPTIONAL I7 PERFORMANCEThe 9th Generation Intel Core processors redefine mainstream desktop PC performance. The i7 9700K features eight cores for more processing power and efficient multi-tasking. The Unlocked feature on this chip allows for overclocking enabling you to tweak the performance. Intel Turbo Boost 2.0 technology has also increased the maximum turbo frequency of 4.9 GHz, and it features up to 12 MB of cache memory for ultra smooth gameplay and responsiveness. The 9th gen i7 processor allows you to enjoy excellent gaming and VR experiences. put yourself in the game A high-performance processor is key to achieving a balanced platform to make your VR experiences great. Attach your premium head-mounted display (HMD) to an Intel Core i9, i7 or i5 processor based PC, and prepare to be amazed. The performance of the 9700K processor allows for a very smooth virtual reality experience. Keep in mind that great VR experiences involve the entire platform, not just any one component. The ideal combination of processor, graphics, I/O connectivity, display, and audio are required, but be assured that this 9th Gen i7 Intel Processor won’t let you down. 9TH GEN PROCESSOR FAMILY The 9th Generation Intel Core processor family is a great investment in your desktop experiences—whether for gaming, entertainment, or general-purpose computing wherever your life takes you. From the jaw-dropping performance of the Intel Core i9 processor with eight cores to the practical capabilities of the Intel Core i5 processors, our latest generation of desktop processors fits a wide range of budgets and needs. Whether you’re a performance-hungry professional, an exceptional enthusiast, or a first-time buyer, there is a 9th Generation Intel Core processor that will enable the experiences you seek. Stream and play in 4K UHD Desktop computers based on the 9th Gen Intel processors integrate advanced media technologies that bring premium, high-quality content to your desktop to deliver smooth streaming of premium 4K UHD entertainment to your PC. Push Past the Limit with Overclocking! UNLOCKED CPU •Maximum processor frequency with Intel Turbo Boost 2.0. •Altering clock frequency or voltage may damage or reduce the useful life of the processor and other system components, and may reduce system stability and performance. Product warranties may not apply if the processor is operated beyond its specifications. Check with the manufacturers of system and components for additional details. © 2018 Intel Corporation. Intel, the Intel logo and Intel Core are trademarks of Intel Corporation or its subsidiaries in the U.S. and/or other countries. 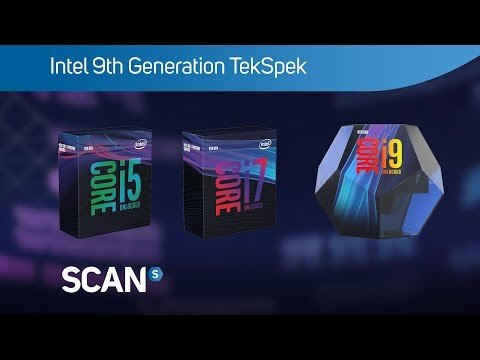 Intel is today bolstering its 8th Gen Core desktop CPU line-up by releasing eight new processors and four new 300-series chipsets. This TekSpek examines what's new. Say hi to the 8th Generation Core processors, codenamed Coffee Lake. Intel has increased the amount of performance by adding more cores and/or more threads to each processor in the family.